We are excited to introduce Jessie Scott as the blogger for Healing Touch Charlotte. Jessie has a Bachelors degree in health science as well as a certificate in Therapeutic Massage. Jessie completed the massage therapy program at SPCC in Monroe, NC and worked as a Massage Therapist while pursuing her Bachelors degree. 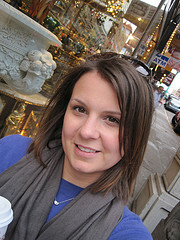 Jessie has also been writing at her personal blog, Don’t Forget Dessert, since fall 2009.